Today I found how caffeine is removed from coffee to produce the decaffeinated version of the world’s most popular drink. There are several different methods used that can make coffee relatively decaffeinated. The drawback (or advantage, depending on your preference) of all of these methods is that they generally make the coffee flavor milder due to caffeine being one of the components which gives coffee its bitter, acidic flavor. The general decaffeination processes includes soaking the still green coffee beans in hot water (160-210 degrees Fahrenheit) and then some sort of solvent or activated carbon is used to extract/dissolve the caffeine. The solvents typically used are methylene chloride or ethyl acetate. Unfortunately with this process, the first batch of beans loses most of its flavor to the water and is often thrown out. However, once the dissolving liquid is saturated from the first batch, the subsequent batches retain much of their flavor. In some methods, the coffee beans from the first batch will be re-soaked in the water solution to reabsorb some of the flavor compounds, minus the dissolved caffeine, so that they can eventually be used for making decaffeinated coffee. The first such process, as described above, for decaffeinating coffee was invented by Ludwig Roselius in 1905. This method used benzene, a potentially toxic hydrocarbon, to remove caffeine from presoaked green coffee beans. Coffee was steamed in brine and then benzene was applied to the beans. Nowadays, this method is considered unsafe and no longer used. Another method is where the beans are steamed for half an hour, rather than immersed in water, and then rinsed with solvents – ethyl acetate or methylene chloride to extract and dissolve the caffeine from the beans. Ethyl acetate is an ester that is found naturally in fruits and vegetables such as bananas, apples, and coffee. The solvent is first circulated through a bed of moist green coffee beans and then recaptured in an evaporator while the beans are washed with water. After the chemicals are drained, the beans are steamed again. Usually the solvent is added to the vessel, circulated and emptied several times until the coffee has been decaffeinated to the desired level. The coffee is said to be ‘naturally decaffeinated’ when ethyl acetate derived from fruit or vegetables is used. The advantage of using these solvents for decaffeinating, is that they are generally more precisely targeted to caffeine and not other components that give coffee its distinct flavor. Up to 96% to 97 % of the caffeine from coffee can be extracted this way. Another method, is known as the Swiss Water Process and employs a charcoal filter. The charcoal is normally used in conjunction with a carbohydrate solvent (highly compressed CO2 ) so only the caffeine is absorbed. In this method, first, the green coffee beans are soaked in hot water and then the first batch of coffee beans is discarded. The caffeine is then stripped from the solution by activated carbon filters. This leaves the solution saturated with flavor compounds which is then reused to soak a new batch of decaffeinated green coffee beans. This method extracts up to 98% of the caffeine. Carbon dioxide is also a popular solvent because it has a relatively low pressure critical point. Another method known as the sparkling water decaffeination process is similar to the CO2 method, but instead of removing the caffeine with activated carbon filters, the caffeine is washed from the CO2 with sparkling water in a secondary tank. This type of solvent consists about 99.7% compressed carbon dioxide and 0.3% water. The coffee industry in the United States alone is valued at about $19 billion annually. It takes five years for a coffee tree to reach full maturity. After that, each tree bears 1-2 pounds of coffee beans per growing season. A six-ounce cup of coffee typically contains approximately 50 to 75 milligrams of caffeine. This amount varies depending on the method of preparation and the type of coffee. 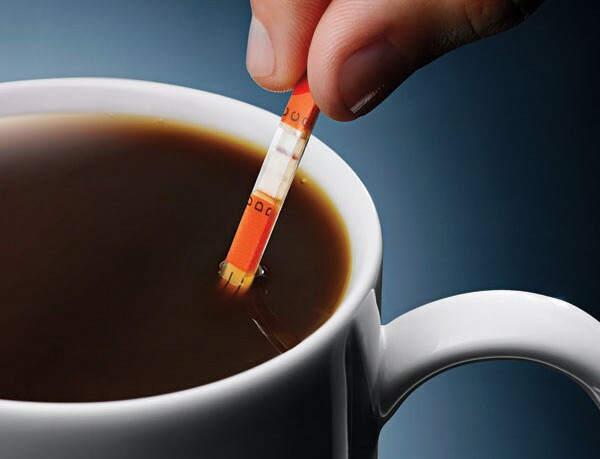 Unfortunately for people who are sensitive to caffeine, as little as 10 milligrams can cause discomfort making caffeinated coffee unpalatable for them. There are 1,200 different chemical components in coffee with more than half of them contributing to the flavor of coffee. Decaffeinated coffee still contains a small amount of caffeine, thus decaffeinated coffee is not technically caffeine-free. Today, decaffeinated coffee accounts for approximately 12% of total worldwide coffee consumption. I can’t believe they go through all this, then charge the same price as regular coffee. Is this what is causing the rise in coffee prices. Personally, I would rather stick to the pure stuff and use a bit less. I also understand that the darker the coffee, the less caffeine it has. Supposedly, more caffeine gets burned off the longer it is in the sun (or wherever). Do you know anything about this? The most popular drink in the world is not coffee but tea.. In terms of coffee vs tea.. I’m not certain, multiple sources contradict each other. Tea is the most popular drink because water is not considered as a “drink” its a necessary liquid for our bodies. I really doubt that. Are you English? The English drink tea more than coffee, but I have been to more than 15 countries and England is the only place I was offered tea instead of coffee. I enjoy a good cup of English tea, strong with honey and milk. Not much into the herbal teas though. What about my questions (above)? I live in England, but I am an American, and it seems like tea is the most popular drink in the world, but in reality coffee is. I drink decaf coffee, and even after three cups I feel some trace of caffeine. It must still be inside the drink, caffeine that is. Ed may be onto something. All over Asia tea is immensely popular. A billion Chinese people might take issue w/ this argument. Yes, Asians drink tea, but with the exception of Great Britain, coffee is the choice in the rest of the world. Maybe Argentina is also an exception as they like that strong tea that I seem to have forgotten the name of. (If you watch “Motorcycle Diaries” the two guys drink it to stave off hunger.) My friend swears that is how she has maintained her weight all these years while others around her are all gaining. Even Wikipedia won’t convince me. Latin Americans drink coffee; Canadians & Americans drink coffee. Europeans drink coffee. The English, Chinese and Japanese drink tea. The rest of the world tends to be kind of split in half: many people drink tea and many drink coffee. I know China is large, but NOT that large. The vast majority of Asia drinks tea rather than coffee, including the Chinese and Indians. That’s why tea is more popular and the global production of tea dwarfs that of coffee because tea drinkers on average drink more tea than coffee drinkers drink coffee. I’m an average coffee drinker and I have an average of 2 cups a day. Sure there are wired people who have 20 cups but they are outliers. The average tea drinker, especially in Asia, drinks far more than that. In China, for example, green tea is basically drunk like water at meal times and at work, most people have a refillable tea thermos on their desk. Green tea has far less caffeine being the reason why this is possible. Green Tea also has other health benefits. I have spent a lot of time in China and every house I visited, every place I went, Green Tea wasn’t offered, they just gave it to me. If I didn’t want it, I didn’t drink it. The thing I dislike about the way most serve tea in China is that they just put the leaves in and leave them there. Perhaps I am spoiled but I really don’t care to have to keep removing tea leaves from my mouth when one slips by. It isn’t that difficult to remove them. There are even special cups with a snap on top that filters out the leaves. Kind of like those special cups for driving but with a little screen filter at the spout. As I mentioned earlier, the darker the coffee, the less caffeine, according to my understanding. I read that the longer the bean is roasted, the more caffein that gets burned off. I hope this is true as I love a strong coffee, but not so much the effects of caffeine. I do remember having an Islandic boyfriend many, many years ago though, that used to make expresso that had me buzzing for hours. What is this nonsense about “drinking tea”? You take tea; therefore tea all around. The most consumed beverage after water. It is generally true that darker roasted coffees have less caffeine. Dont the coffee beans absorb these chemicals? That cannot be good for the consumer. Basically they end up drinking solvents!